Has anyone here played Final Fantasy XIII? I was super excited for the game, especially given how extremely much I loved XII, but when it finally arrived my anticipation gave way to disappointment really quickly. The game starts out with a really impressive cut scene, (I mean, no matter what negative things you can say about the game, the visuals are really stunning), and when cut scene ends and you take control of the character for, oh, about thirty seconds. Then there’s another cut scene. The character is yours again, for maybe a minute this time and then, yep, cut scene. The game continues like this for way too long, and normally I’m a fan of the cut scene, they’re like sparkly little rewards for all your finger mashing hard work, but when you buy a game you actually want to play it, you know? Otherwise just rent a movie. 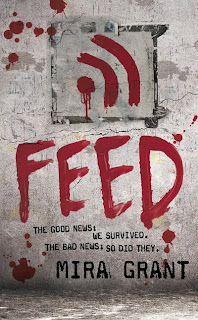 Reading ‘Feed’ reminded me of nothing so much as the start of Final Fantasy XIII. The book is all tiny bite sizes piece of actual plot, massive info dump, half a page of character interaction, massive info dump. And it’s not just at the start either, the whole entire book is like that. And it’s not that the info dumps are boring, because they’re actually not. 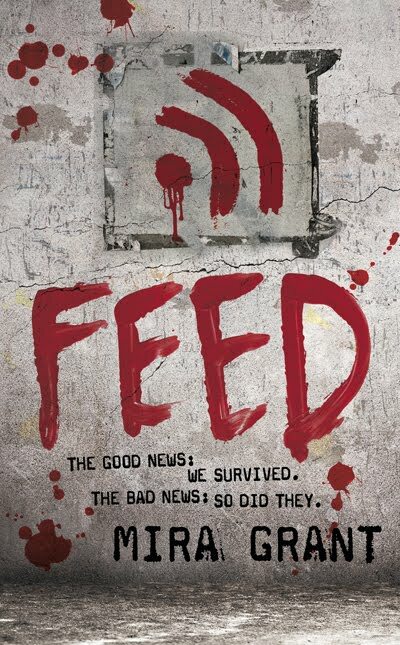 The book, as you’ve probably heard, is set in a future the zombie apocalypse has been and gone and the world has adjusted. I don’t doubt that the “science” behind the outbreak is pure rubbish, it was still really interesting explore the ways society might react to a zombie outbreak in the long term. The over the top security and testing seemed plausible to me, and like I said, it was interesting. The problem is that I don’t buy books to read about hypothetical pet laws and security features- I buy books for the stories. And getting to the story in Feed was an exercise in frustration. This is only made worse when you realise that the annoying excess of infodumping is actually the best thing about the book. The plot, once you peel all the infodumps away from it, centres around a presidential election and the team of bloggers assigned to covering it. I couldn't have cared less about it. It might cultural thing, my overall apathy to the plot line. Not being an American I don’t quite get the zeal that surrounds presidential elections, and this might explain why I cared so little about what was happening. But that’s not right, is it? After all I’ve never lived in a feudal society, but I can rattle off a long list of books where I’ve cared who makes king or queen very much. I’ve never been a cop, or an assassin, or lived in a post-apocalyptic wasteland or traversed oceans by ship, but I’ve read books that have made me care about these things. That’s kinda the point to books isn’t it? Georgia and Shawn, our main characters an adopted siblings, are not much better. I get the feeling we’re supposed to see Georgia as this super star of hard news, fighting in the name truth, justice and the American way. Mostly she just goes on and on about the nobility or the news reporter, and the public’s right to truth. Which, hey, I agree. But to say it gets laid on thick would be an understatement. After the twentieth mention of how bloggers are the new American hero my eyes were sore from rolling too much. And I could never quite get a handle on the relationship between Georgia and Shawn. Are they just a really close brother and sister? Are they sleeping together? I don’t know if the book was making it so ambiguous on purpose, but it really bugged me. Despite all the negative things I’ve said about this book, I didn’t hate it. The interesting world building, even if it was delivered to the reader via info dump after info dump, was interesting and went a long way in saving the book. I can’t say that I’ll be actively seeking out the sequel, but if I’m ever like, stuck in an airport or something, I would probably pick it up. Please help Mira Grant (Seanan McGuire) in her fight against Amazon!